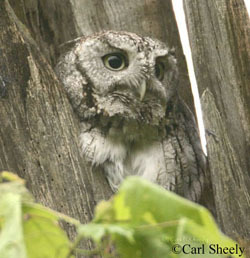 The Eastern Screech-Owl is a widespread and common breeding owl in Tennessee. Though rarely seen, it is the most numerous owl in the state. This very well camouflaged bird hides in tree cavities and crevices during the day, but its “spooky” trill at night is distinctive. A small, stocky, owl with a large head and feathered ear-tufts, giving it a silhouette much like a Great Horned Owl. Its wings are rounded and the tail is short and square. The eyes are yellow and the bill is greenish. In both sexes there are two color morphs; a reddish brown or a gray morph, both having complex patterns that provide excellent camouflage against tree bark. The female is slightly larger, but the male’s voice is lower. Found in a variety of habitats, but more common on the edge of hardwood forests, wetlands and in suburban neighborhoods of second growth forest. An evening or nocturnal hunter with a diverse diet including: small mammals, insects, lizards, snakes, crayfish and small birds. In Tennessee, breeding begins in late winter with egg laying peaking in late March and early April. Pairs are mostly monogamous and some remain together for life. Nest sites are in tree cavities, but these owls will often nest in boxes made for Wood Ducks. Clutch size: 4-6 white eggs. Incubation: mostly by female. The eggs hatch after 26 days and the young fledge about 31 days later. Both parents will continue to feed young for up to 3 months before they disperse. The territorial call is often described as a descending and mournful horse-like whinny. A whistled tremolo or trill on a single pitch is used when communicating with mate or family. Like most owls, gulps down prey whole and later regurgitates the indigestible parts in a compact pellet. The curious bird detective may sometimes find these pellets under a favorite roost site, and dissect it to learn what the bird has eaten. Eastern Screech-Owls are usually monogamous and pairs remain together for life. On occasion, males will mate with a second female, who may evict the first female, add her own eggs in the clutch, and incubate both sets of eggs. The trill and descending whinny-like song of the Eastern Screech-Owl is sometimes used for ambience in television and movie night scenes. The whinny is used in territory defense and the songs are usually uttered separately. Even though Eastern Screech-Owls are known to eat European Starlings, starlings regularly evict screech-owls from their cavities and nest there themselves. 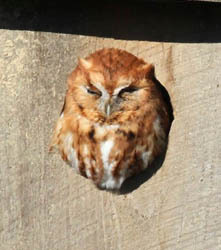 Eastern Screech-Owls will use the same box design that is recommended for American Kestrels. 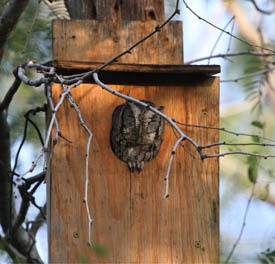 Eastern Screech-Owls will also readily nest in Wood Duck boxes. Use natural, uncoated wood such as cedar or redwood which are more durable than pine or exterior plywood. Use at least ¾ inch boards. The entrance hole should be 3 inches round. You may consider raising the floor of the nest box ¼ inch up from the bottom of the box to prevent rotting. Place a couple inches of saw dust or wood chips in the bottom of the box for nesting material. Use of a predator guard on the nest pole is recommended. Nest box should be placed at least 10 feet high on the edge of woods, fields or wetlands. To prevent use by squirrels, the box should be mounted on a pole with a predator guard and placed away from trees. Boxes should not be placed in areas where there is extensive use of insecticides and herbicides. Periodically check nest boxes throughout the spring to determine use by Screech-Owls or other wildlife. Remove European Starling nests as necessary. Depending on nest box use, replacement of the wood chips after the breeding season may be necessary.